Tajuddin Baba of Nagpur was born on the 21st of January in the year 1861 at a place called Kamptee situated near Nagpur in the state of Maharastra. He was one of the Five Perfect Masters of Meher Baba. Tajuddin Baba was born as a unusual child. It is said that he did not cry as a baby and physical torture was done to him by his parents in order to make the child cry. Baba wore the marks of these tortures on his body until last. Like Narayan Maharaj, Tajuddin Baba also lost his parents at a very tender age. His maternal grandmother and uncle Abdul Rahman looked after his needs. While studying as a child in a Madarasa or a School in Kampti, near Nagpur, he came in contact with a spiritual master Hazrat Abdulla Shah, who immediately recognized the spiritual potential in the child and initiated him to the path, by giving him a dry fruit to eat. Baba was given the instruction to "Eat less, sleep less and speak less. Read Quran”, by Hazrat Abdulla Shah. With this contact Tajuddin Baba lost all his material consciousness and started enjoying oneness of "Adwaita". His personal experience of the oneness made him isolate from the world and he remained in personal seclusion, away from the world. Later at the age of 20 during 1881, He joined the Nagpur Army Regiment as a sepoy (Soldier). The gift of the Master was in His heart and He hardly found any solace in the day to day working of the Army. After this regiment was posted to Sagar, Baba spent most of His time with Hazrat Baud Saheb, a very well known spiritual person of Sagar. This Hazrat Baud Saheb thus became a spiritual Guru of Hazrat Tajuddin Baba. With more and more time being spent with Hazrat Baud Saheb, His official work suffered and ultimately he tendered resignation to become free, which He already was. His oneness with God made Him unaware of the world around Him and He started roaming in the streets of Sagar naked like a Mast. Gradually His relatives and friends came to know about this and they called Him back to Kampti near Nagpur. All medicines and various Doctors were tried but of no avail Tajuddin remained in His state of absolute forgetfulness of the world. Although the stories of His miracles spread, yet the society started opposing His naked roaming from here to there and unfortunately He was admitted to a Mental Asylum on 16th of August 1892. Hazrat Tajuddin Baba's glory spread from the Nagpur Asylum as He was often seen outside the Asylum in Nagpur and at various places in Kamptee. The British officers of the Army who were surprised at this, made proper investigations and found Him properly locked up in the Asylum. Ultimately the investigating officials became His disciples, and started to regularly visit Him. The Hospital became a place of pilgrimage to the growing number of visitors day by day, who came to Baba for blessings. Later Maharaja Bahadur Shrimant Raghoji Rao Bhonsle, the Maharaja of Nagpur became a disciple of Hazrat Tajuddin Baba and moved an application for His release to the Governor, against a security deposit of Two thousand rupees. On the 21st of September 1908, after His release, Baba was brought to Maharaja's 'Palace'. Since then this Palace, which is now within the heart of the Nagpur City, Baba became the epicenter of Tajuddin Baba's divine work. Hazrat Tajuddin Baba, like all other Spiritual Persons who become known for their compassion, was constantly being approached by the rich and the poor for a cure for the worldly pains and no one ever left without His blessing and what-so-ever material desires they wished. His Glory spread like jungle fire and thousands and thousands came to the palace at Shakardara to bow down to Him. Taj, as the word means, was the crown of Divinity, for a stream of disciples from all walks of life, and from all schools of religious faiths. By 1925 Baba was nearly 65 years old, and became weak and exhausted. It was in August 1925 that Baba's health deteriorated much, and Maharaja Raghoji Rao availed the services of the best Physicians of Nagpur to treat Baba, but of no avail. 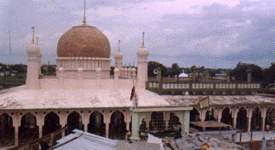 Baba was asked if He would permit the large number of devotees who were anxiously awaiting for a glimpse of their Hazrat, and with Baba's willingness, the Palace was opened to all, who came in a large number for a last blessing from the King of Kings, the Taj of Sadguru's, Hazrat Tajuddin Baba. It was so, on 17th of August 1925, that Baba left the physical form, but He is and shall always remain in the hearts of all of His devotees. Meher Baba referred to the status of a Perfect Master in His famous book "God Speaks", that a Sadguru or Qutub is the highest of the High, and no one can realize self without the grace of the Sadguru. All else gathered is nothing but just the shadow of the infinite reality. Meher Baba explained the philosophy of creation simultaneously in three principal schools of thoughts " Sufi", "Mystic" and "Vedantic". He unified the terms of the three basic thoughts and their common references in a parallel manner. He clearly presided that the real miracle is the realization of the Self, and all other worldly miracles were just a eye wash. Only sometimes the real Masters use these Miracles as a foreword to the Book of the longest Travel Story, the journey of the Soul to the Soul of Souls. Those who are Real give us the real, and that once given, makes one so immersed in his own Oneness that now nothing can be given nor taken away. I am insane, but they keep calling to me. No one here knows me, but no one chases me off. My job is to stay awake like the Night-watchman. they recognize me. They say, There's daylight.